hey have been called the Greatest Generation, the men and women who fought World War II and launched an era of unprecedented prosperity and progress in America. The war generation transformed civic life in the United States. They also nurtured the sports of mountaineering and skiing from infancy to maturity. Veterans of the 10th Mountain Division are renowned in the Rocky Mountains and New England for their contributions to downhill skiing and technical mountaineering. Ironically, they are less well known in the Northwest, where the 10th was born on the slopes of Mount Rainier. Northwest men were key members of the division and after the war they contributed to outdoor recreation in this region just as they did elsewhere in the country. One of the earliest recruits into the mountain troops was Roe Duke Watson. Duke Watson at the Columbia Icefields, 1942. Courtesy Duke Watson. Duke was born in November 1915 in Alton, Illinois, near the banks of the Mississippi River. His father, an attorney, died when Duke and his brother Ed were very young. Growing up in Mark Twain country, Duke’s interest in the outdoors was stimulated by raft trips on the Mississippi, Huck Finn-style, starting when he was about twelve. Duke and his friends made their own rafts and did the trips for several years without their parents’ knowledge. (Their parents thought they were hiking.) To escape the heat and humidity of the Mississippi Valley in summer, Duke’s mother took his family on railroad trips to the Great Lakes and later to Colorado and the Far West. During a layover in Seattle on one of these trips, Duke fell in love with the Northwest and decided to live here. Duke studied Forestry at the University of Michigan, hoping this field would offer him the best chance of employment in the Northwest. After graduation, he moved to Washington in the fall of 1937. He found work in the Skagit Valley in the waning days of railroad logging, using steam-driven skidders, slack lines, and inclined railways. During the late 1930s and 1940s he witnessed the transition from hand saws (called “misery whips”) to power saws and from steam power to truck logging. He began climbing in the summer with Everett members of The Mountaineers. In winter he took up skiing at Mount Baker and Mount Rainier. In March 1941, while he was working for Sound View Pulp Company in Everett, he was drafted into the army. After the German invasion of Poland in 1939 and the Blitzkrieg into Western Europe in 1940, American involvement in World War II seemed inevitable. In the winter of 1939-40, Soviet armored troops invaded Finland. The Finns, outnumbered in some cases forty-to-one, held off the Russians for over three months. In the woods of central Finland, squads of Finnish skiers, cloaked in white and following hidden forest paths, launched daring “road cutting” operations against the invading Russian columns. A road-bound column would be encircled and the road blocked. Then the skiers, aided by the brutal winter weather, would starve, freeze, and ultimately hack the enemy to pieces. Although the Soviets eventually overwhelmed the Finns in conventional fighting farther south, the skill and bravery of Finnish ski troops inspired the U.S. War Department, lobbied by the National Ski Patrol, to experiment putting American soldiers on skis. 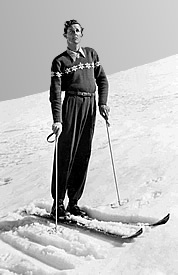 Ralph Bromaghin skiing shortly before World War II. Bromaghin would become Watson’s best friend in the army and play a role in saving Duke’s life. Enlarge. Denver Public Library, Western History Collection. Lacking a unit of his own, McLane hooked up informally with Paul Lafferty’s men. On December 7, Duke Watson, Charles McLane, and Ralph Bromaghin, all buck privates, joined Capt. Lafferty for a day of weekend skiing on Mount Rainier. As they prepared for a tour to the Muir Snowfield, their car radio crackled with news of a Japanese attack on Pearl Harbor. Returning to Fort Lewis, they found the base blacked out and the men bivouacking outside the grounds. Where the Axis couldn’t harm me. The Mountain Troops for me. Started rafting the Missisippi River, Huck Finn-style. Moved to Northwest. Found work in logging. Began climbing and skiing with Everett Mountaineers. Hitler invaded Poland, unleashing war in Europe. A million Soviet troops invaded Finland supported by tanks, aircraft and naval forces. Finnish troops, outnumbered in some cases forty-to-one, held off the Soviets for over three months. Newsreel films made the white-cloaked ski warrior the symbol of Finnish resistance. The National Ski Patrol and American Alpine Club urged the War Department to introduce mountain warfare training in the U.S. Army. A few officers within the Army were already working along these lines. The War Department ordered the formation of experimental ski patrol units in sixth northern divisions, including the 3rd Division at Fort Lewis and the 41st Division in Spokane, WA. The 3rd and 41st Division ski patrols trained on Mount Rainier under Capt. Paul Lafferty and Lieutenants John Woodward and Ralph Phelps. At the end of their training they crossed the Olympic Mountains on skis and traversed the Cascades from Snoqualmie Pass to Naches Pass. 1st Battalion, 87th Mountain Infantry Regiment activated at Fort Lewis. 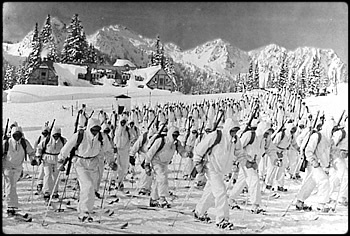 During the winter of 1941-42, 400 men of the new regiment trained on skis and snowshoes at Paradise on Mount Rainier.